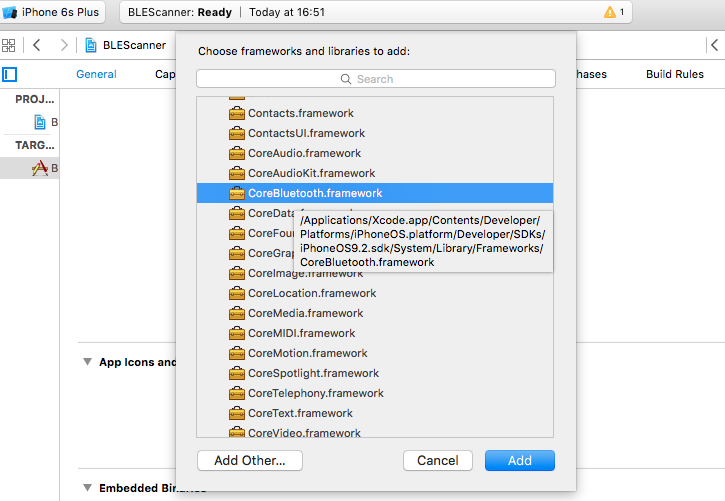 This post will show you just the minimum effort needed to get a list of BLE (Bluetooth 4.0) devices that are advertising on your iOS device. Make sure you have an iOS device with BLE and another device that is capable of advertising its BLE services ( I am using an RFDuino, with it’s device name set to Display). Create a new single view Swift project. Add a UITableView to the ViewController in the pre-made Storyboard. Add a UITableviewCell to the tableview with identifier “cell”. Attach the datasource and delegate from the UITableView to the ViewController in the Storyboard. 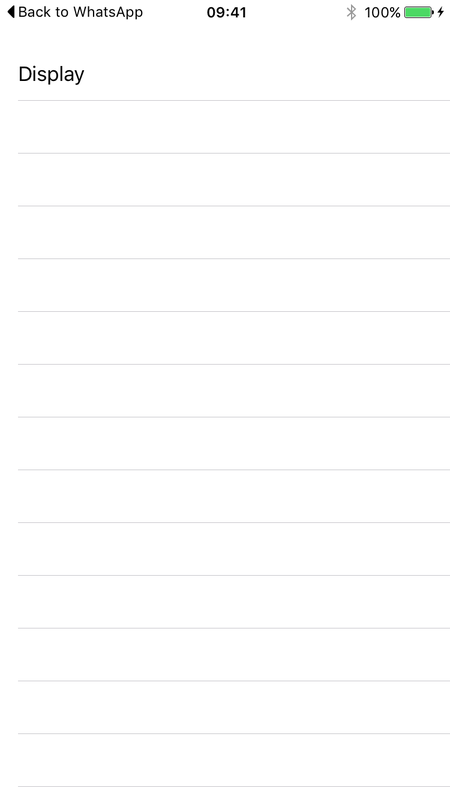 Add an IBOutlet for the UITableView in your ViewController class. Make sure the class for the ViewController is set to the class ViewController. Add the CoreBluetooth framework to your project. centralManagerDidUpdateState will be called whenever the CoreBluetooth BLE service state changes. For this example I am only checking if the state == .poweredOn but there are other states you can check for such as off, unknown and resetting. When the state is on we initiate a device scan using scanForPeripheralsWithServices. If the service finds a device the delegate method didDiscoverPeripheral is called. In this method we just get the newly discovered peripheral and add it to our array of peripherals. We then call reloadData on the tableView so that the new object in the array is used in our tableView. I have only used the name property from the peripheral but there is loads more stuff to play with. Could you post the complete project with UI codes? I am new to IOS and would like to learn from your example. Thanks. I want to scan and update table every 5 seconds, how to do that? I want to update the list of discoverable BLE devices every 5 seconds, how do i do that? There is a delegate method for CBPeripheralDelegate that you can use on your discovered peripheral, alternatively you will see an RSSI parameter in the didDiscoverPeripheral delegate method. I get the error, Binary operator ‘==’ cannot be applied to operands of type ‘CBManagerState’ and ‘CBCentralManagerState’, at the line, if (central.state == CBCentralManagerState.PoweredOn). Any idea? Change “CBCentralManagerState.PoweredOn” to “CBManagerState.PoweredOn”. Apparently the former was deprecated in iOS 10. CBCentralManagerState is deprecated is newer swift version. Hope this helps. // Indicate to user that the iOS device does not support BLE. It looks like this will scan and show the same devices many times. Consider using a set instead of an array. I tested it with my iPhone to find my Raspberry Pi Zero W having BLE, but it did not find it, I wanted to ask you why can’t do it ? , maybe you have an explanation to help me? As per the code, the phone should not be paired with the device??? Go to Bluetooth options in phone settings and click on “Forget this device” for the device you are trying to connect and try running again. Can You tell how to get mac address of BLE devices? How to get list of wifi networks on IOS – swift ?